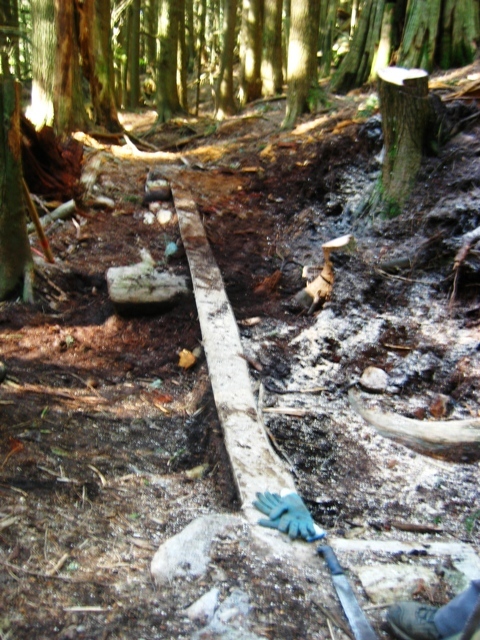 On Saturday, February 20th, DNV staff and volunteers from the NSMBA removed a downed tree on Lower Oilcan. Removing the tree was complicated, as it had pushed over another standing dead tree and was resting on top of a skinny. We cut off the majority of the downed tree, and then used rigging, a pulley system and some elbow grease to stand the tree back up. This shifted the root ball back into it's orginal position, allowing us to safely remove the standing dead tree without damaging the skinny. Thanks to the volunteers who helped make this happen, and thanks to Darryl for letting us know about the tree in the first place! If you see something on the trail that needs attention, contact us!